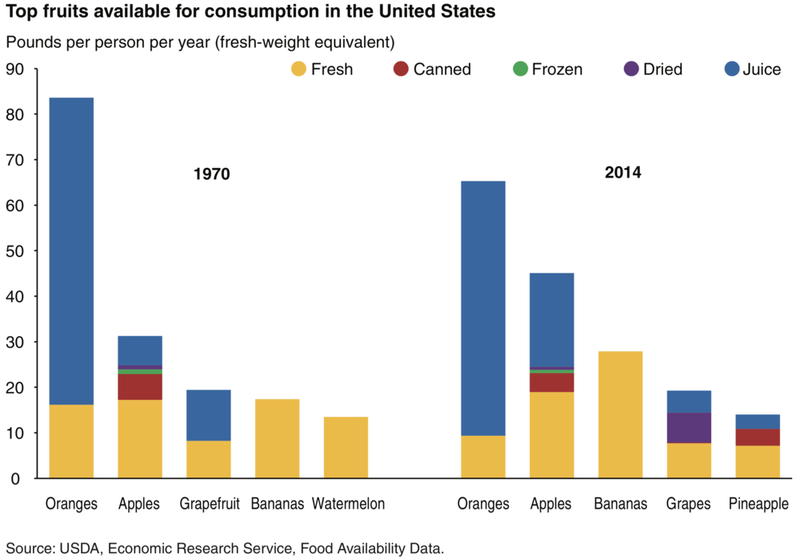 The USDA Economic Research Service (ERS) released a report earlier this year that “examines the amount of food available for consumption and related food trends in the United States from 1970 to 2014”. 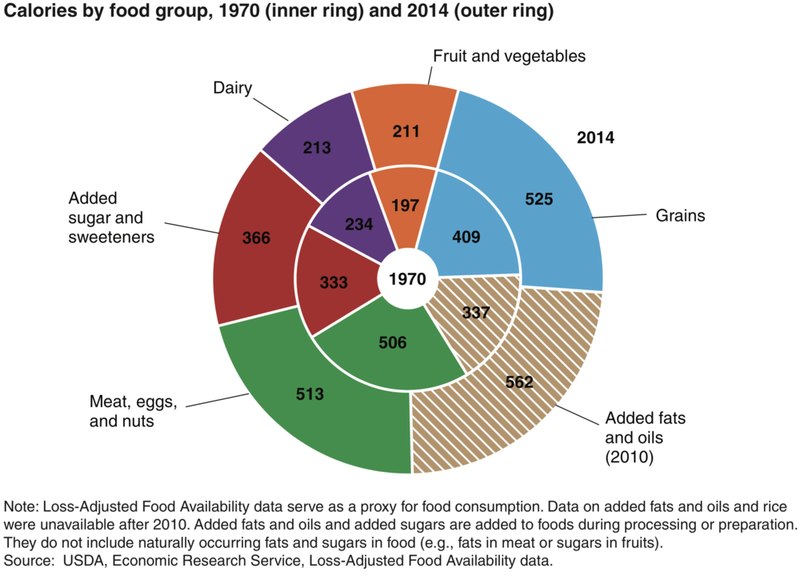 It contains a lot of nice charts that really illustrate how drastically we have shifted our dietary patterns over the past 40+ years. If you are just dying to read the 14,300-word report, you can check out the full publication below. Methodology: How did they obtain these numbers? We went from eating an average of 2,016 to 2,390 calories per day — a 374 calorie increase. ...but we still only eat ~0.9 cups a day, a little less than half the recommended intake. “Pineapple availability grew from 0.7 pounds in 1970 to 7.2 pounds in 2014.” Your pizzas deserve better than this. Shame on you. We hit “peak vegetable” in 2004 and have steadily declined since. We eat ~1.6 cups a day but should be hitting 2.5 cups a day. That puts us 66% under the recommended intake. Go eat some carrots! While total potato product availability stayed mostly the same, frozen potato product availability increased by 62%. …but the data does not account for seeds or soy products. My favorite vegetable is dairy. …and we probably underestimated consumption prior to 2000, when reporting methodology changed. Since the record high in 1999, we’ve seen a 14% drop. But we’re still consuming 10% more compared to 1970.